A hurricane that turned into the greatest rainstorm in U.S. history devastated Houston and the surrounding area this week, leaving nearly a third of the city submerged, driving tens of thousands from their homes, and killing dozens of people. After making landfall on Friday near Corpus Christi as a Category 4 hurricane, Harvey weakened to a tropical storm and moved back into the Gulf of Mexico, and then stalled. For five days, the storm battered southeast Texas with more than 4 feet of rain; one weather station recorded almost 52 inches, 4 inches more than the previous record for the continental U.S. As Houston’s streets and highways became deep, rushing rivers littered with abandoned cars, residents sought to escape their flooded homes by any available means. More than 10,000 people were rescued by emergency workers in boats, trucks, and helicopters; thousands of others were picked up by volunteers in fishing boats, dinghies, kayaks, airboats, and other vessels. More than 32,000 residents took refuge in 231 shelters across the city; many others fled to Austin and other nearby cities. By the time the storm finally moved on, making its second landfall in Louisiana early Wednesday morning, as much as 30 percent of Houston was underwater. It’s encouraging to see officials “putting into practice the lessons of past extreme weather,” said The Wall Street Journal. Learning from the disastrously bad response to Hurricane Katrina in 2005, FEMA teams deployed on the ground before Harvey hit, rather than waiting for governors to request their assistance. “Clear lines of authority” were established between local, state, and federal responders. 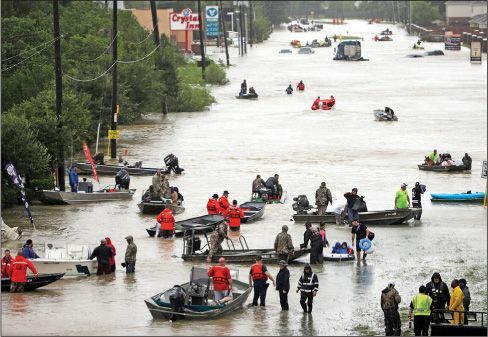 And Mayor Turner was right not to order a mandatory evacuation—when the city told its residents to leave ahead of another 2005 hurricane, “more than 100 people died” in the ensuing chaos.